The Outer Banks has proven itself to be a resilient and powerful tourist destination. From Carova on the Virginia border to Ocracoke, the area has become an economic engine that drives the economy of northeastern North Carolina. There are a number of factors that have created the success, so many that it is not possible to discuss all of them, or even list all of them, at one time. There is, though, one part of the Outer Banks picture that is an integral part of the puzzle but is not necessarily included in discussions of what has created that success story. The property owners who have invested in homes for the rental market are as much a part of the prosperity of the Outer Banks as any other facet contributing to the consistent growth of the region. Certainly the marketing of the Outer Banks as a premier family vacation destination has been extraordinarily important in what has happened. But if investors had not bought property and built homes for those families, it wouldn’t matter how beautiful the Outer Banks may have seemed—no one would have come. Most of our property owners have invested here because they enjoy the Outer Banks and what it has to offer, but those properties are an investment and like any investment it needs to generate revenue. 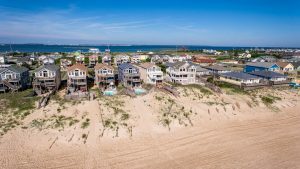 Over the past few years there are some emerging trends in the Outer Banks market that could create some new or additional opportunities for property owners. These are opportunities to enhance the revenue a property generates; it will not replace the summer peak season income. There has been a noticeable and consistent increase in shoulder season visitation. The observation is based on increases in occupancy tax collection over the past five years. We are using the data from Dare County, and there are two reasons for that. Dare County is the center of the Outer Banks tourism industry and is an accurate barometer of activity. Additionally Dare County’s reporting is more up to date than Currituck County or Hyde County that includes Ocracoke. Using occupancy tax as an indicator of trends is a little bit risky—it is just one part of a larger picture. However, in this case, the trends are so strong and consistent that using occupancy tax as a bellwether seems safe. The shoulder seasons are the spring and fall: March through May and September through November. Over the past five years, their percentage growth has outperformed the peak summer season buy a remarkable degree. Keep in mind this is a percentage increase, not a dollar increase, but those percentage increases represent a very significant growth in collections over that period of time. The figures we are using are for 2017 since 2018 is not completed yet. For comparison, here are the occupancy tax collections as reported by the Dare County Visitors Bureau. Looking at these numbers, it is apparent that the bulk of business is occurring during the summer months. However, it is equally as apparent that the increases in visitation in the shoulder seasons is so significant that opportunity must exist in those areas. Every property owner has to decide for themselves how they want to address some of these opportunities; that is not something that can be done effectively in this format. What can be done, though, is to outline some of the factors or forces at work that are creating the opportunities. Probably the biggest driver of visitation in the shoulder seasons is the sustained growth of weddings and events. At one time, this segment of the Outer Banks economic picture was focused almost exclusively on weddings, but increasingly, the Outer Banks is being marketed as a place for events—family reunions, business meetings, and seminars. Although the large event homes are often where people gather, they are not always where people stay, creating an opportunity to provide housing for guests of the bride and groom or family members gathering for a reunion. April, May, September, and October are the big months for weddings. The fall especially has become the King of the Event Schedule on the Outer Banks. September is filled with smaller but popular events. The Eastern Surf Association (ESA) finals are held every year in mid September at Jennette’s Pier in Nags Head; Pridefest has been a very popular event; there are also a number of fishing tournaments. None are huge events, but the aggregate effect is to bring a significant number of visitors to the Outer Banks. October has really become festival month. There are three major music festivals—The Outer Banks Bluegrass Festival in Manteo, the Duck Jazz Festival in Duck and what was the Mustang Music Festival that is now the Mustang Rock and Roast, combining barbecue and food. Things culminate with the Outer Banks Marathon over Veteran’s Day Weekend. There are not nearly as many events or festivals scheduled for the spring, although, and this could have an impact, the Outer Banks Bluegrass Festival is moving to May in 2019. There are some national and probably international trends emerging on how people view travel and leisure. One of the more important emerging trends is seeing a vacation as a time to experience what an area has to offer as opposed to sitting on the beach, reading a book and relaxing. This seems to be a generational shift with younger travelers more apt to look for experiences. With an extraordinary array of activities available, the Outer Banks is ideally positioned to take advantage of this trend. Surfing and water sports, wind sports, ecotourism—the Outer Banks offers all of that in abundance. And, for most of those activities, spring and fall are the best times to do them. The shoulder seasons offer a fantastic opportunity for property owners. It is important to note, though, that there is no one size fits all way to benefit from the trends we are seeing. Outer Banks Blue property owners, contact us and let’s discuss how best to take advantage of the spring and fall shoulder seasons.